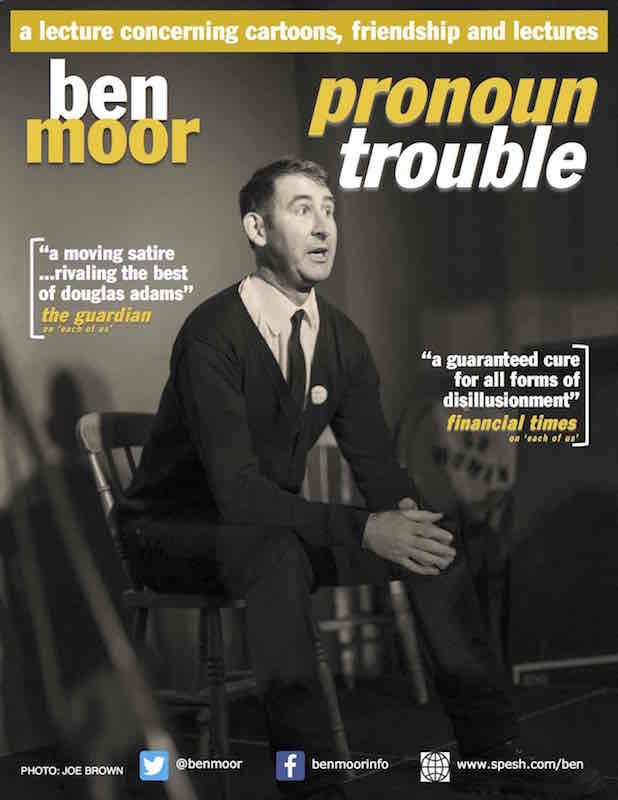 These dates have just been announced of the new show PRONOUN TROUBLE by the performance artist BEN MOOR, who is funny, graceful and clever. You will know him best as the uncredited and unpaid body model for the eponymous hero of the blockbusting Disney film Arthur Christmas. I urge you to attend this event, especially at Jane Bom-Bayne’s in Brighton, the perfect venue for Ben, where it is a dbl bill with a show by the nutty Joanna Neary. This year has seen two main blizzards up to now. Then came the more metaphorical blossom one, which somehow always surprises us, but it shouldn’t because trees. But, what, hey, look out, there’s another blizzard comin’ atcha. An even more metaphorical blizzard that doesn’t involve white stuff throwing around in the air, but rather a set of places and dates and facts. And they’re all to do with my show Pronoun Trouble (and then there’s some extra things tacked on the end there). So please dress blizzard-appropriate (actually, dress how you like) and enjoy the following information-weather. Pronoun Trouble is my current piece of live comedy. It is mainly a lecture about Chuck Jones’s Hunting Trilogy: the wonderful Merrie Melodies cartoons from the early 1950s, in which Bugs Bunny and Daffy Duck befuddle Elmer Fudd as to whether it’s Duck Season or Rabbit Season. But I sometimes go off-subject, and dip into reflections on watching lectures, on pareidolia, on friendship, and on the spelling of certain shop signs on the high street. I performed it in February at Chapter Arts in Cardiff, at Trouble at Mill in Farsley, and at The Hen and Chickens in London, but I wanted to let you know about a slew of upcoming dates – OK, if not exactly a blizzard, then let’s call it a squall – in the Spring and Summer and how to come and see it. Yeah, because there’s badges too. When you email Jane Bom-Bane to book your tickets, you should definitely order a delicious meal to go with the delicious entertainment. A lovely pub theatre on Highbury Corner in Islington, conveniently close to the smartly named Highbury and Islington tube station. Previous performances here have been quick to sell out, so please don’t delay and buy your tickets today. 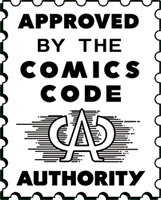 Just a 10 minute excerpt of Pronoun Trouble at this wonderfully programmed night of comedy and learning things, presented by the folks behind Festival of the Spoken Nerd. A wonderful bookshop, and you’ll be able to buy some of the books mentioned in the talk here. Just £5 tickets, and that will get you a drink and nibbles too! The most academic place I have so far found to give the talk, and maybe the coolest. There are lots of other great things going on during the Greater Manchester Fringe Festival too – why not check out the full programme? A compact weekend of terrific speakers, musicians, performers and makers – I’m thrilled to be invited. This will be a wonderful weekend of talks by fascinating folk like Michael Palin, Sally Phillips and Carole Cadwalladr. And I’ll be performing a gentle Sunday morning version as part of the celebration of intelligent distraction. The lecture can be located in the brainy enclave of Einstein’s Garden. I’m so glad to be returning to Green Man; this is always an amazing weekend of music, inspiration, fresh air and laughter.